A circular bus route runs through the town, from one area of economic deprivation to another. 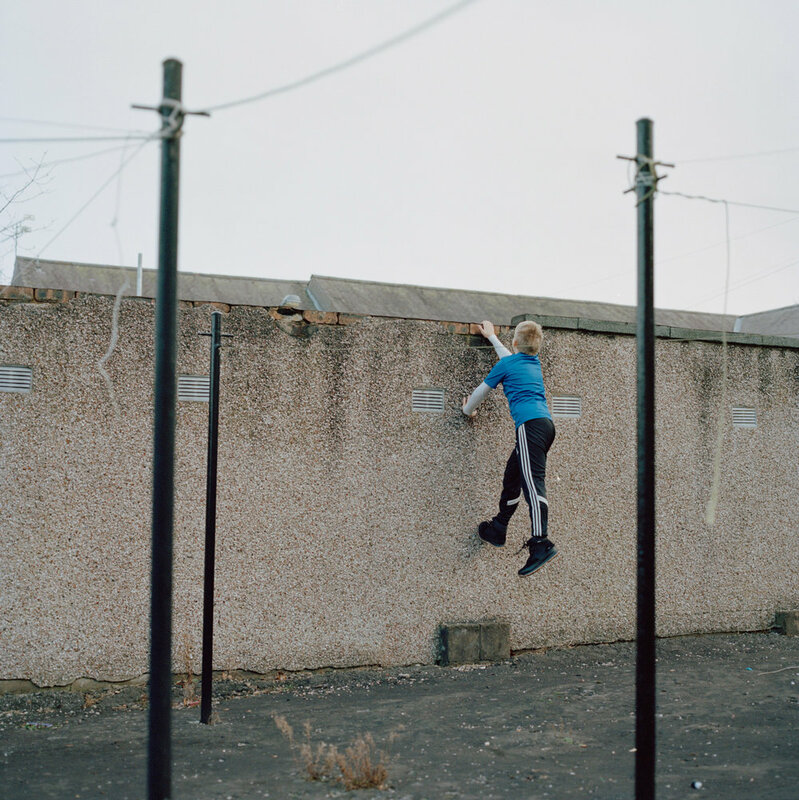 Within this social landscape all that has changed for the children first photographed in 1994 is movement from one area scoring high in The Scottish Index of Multiple Deprivation to another. A simple bus ride across town. Steven close by both his and his youngest sister's flats. Steven is the eldest of the three siblings. He took me for a walk, said he knew a nice place, just up the road. We walked then stopped in an area of open land. I realised quite suddenly this was where his mum had lived before she died in 2008. Steven had lived there with his mum. 'Nothing left here' he said; we took a few photos and walked on. Kyle was born at 28 weeks, weighing less than 2 pounds. A born fighter, always. Chick always wanted a little girl. After she had Leah, she knew she didn’t want, or need, any more children. She had her daughter. Chick and Leah got a necklace out of Argos. One half says ‘I Love You', the other half says ‘To The Moon and Back’. They separated the necklace and each wear half. 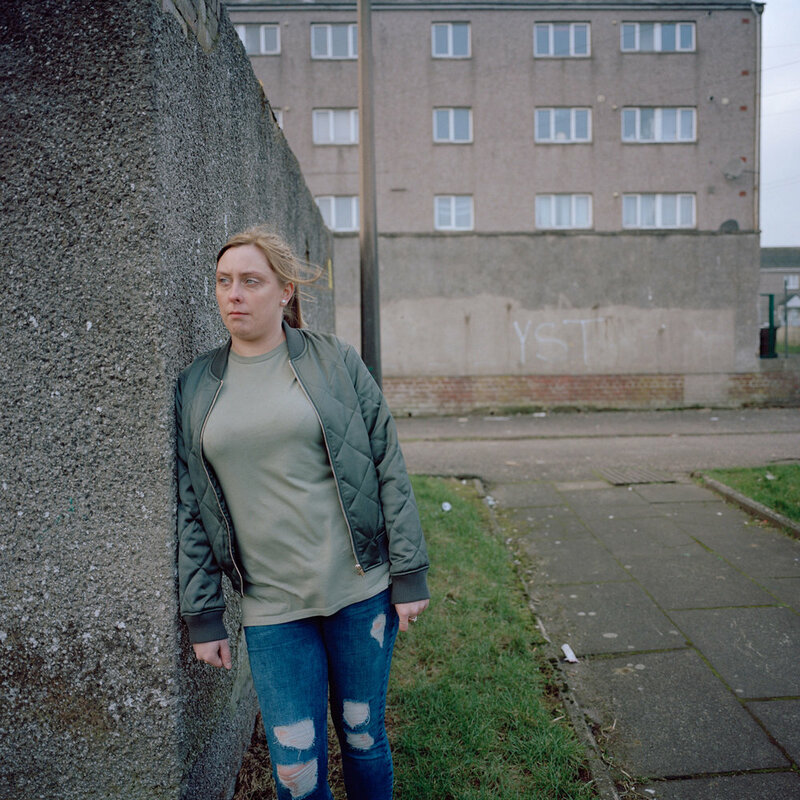 Kyla tells of how she gets 'slagged off' at school for living in a flat. In Stirling, most people live in houses with a front and back door. And a garden. Chick is the youngest of the original three siblings. She lives with her daughter, Leah in a flat close to the others. Over the years, Chick has been homeless on several occasions, living in temporary accommodation in various places while doing her best for herself and her daughter. She likes to look through shop catalogues, browse them intently, looking at all the things she would like for her house, to make it her home. Steven in his 'Homeless Flat' with photos of his nieces in the background. When you move into a homeless flat they feel all the same; same couch, same curtains, same furniture. Everybody knows when they come in that you’re in ‘the homeless’. When Steven moved into his flat, his youngest sister Chick gave him things to make it more like a home: "...wee things like salt and pepper and mayonnaise and pictures of the weans (children)". The window stayed unrepaired for so long that it became a destination for Leah to decorate, to make pretty. On it, she wrote ‘Leah loves Dadd’. Kellie is the middle child of the original three siblings. Kellie had a job but the hours wouldn’t fit in with her need to be there for her children outside of school. It is this inability to find options, options that help you on, keep you better, financially and mentally. It is like a shut door and the only one open leads to a drop. Liam runs around, he jumps up high, seeing how far he can reach. It was high summer, or as high as it ever gets in Scotland. As I stood out on the balcony of Kellie's third floor flat, I looked back in. Back in at Courtney. At her reality. At age ten, Leah had lived in over ten different places. With grandparents, family, homeless accommodation. Leah is strong and proud and determined. Sparkling. Here is where she feels settled. This is home. 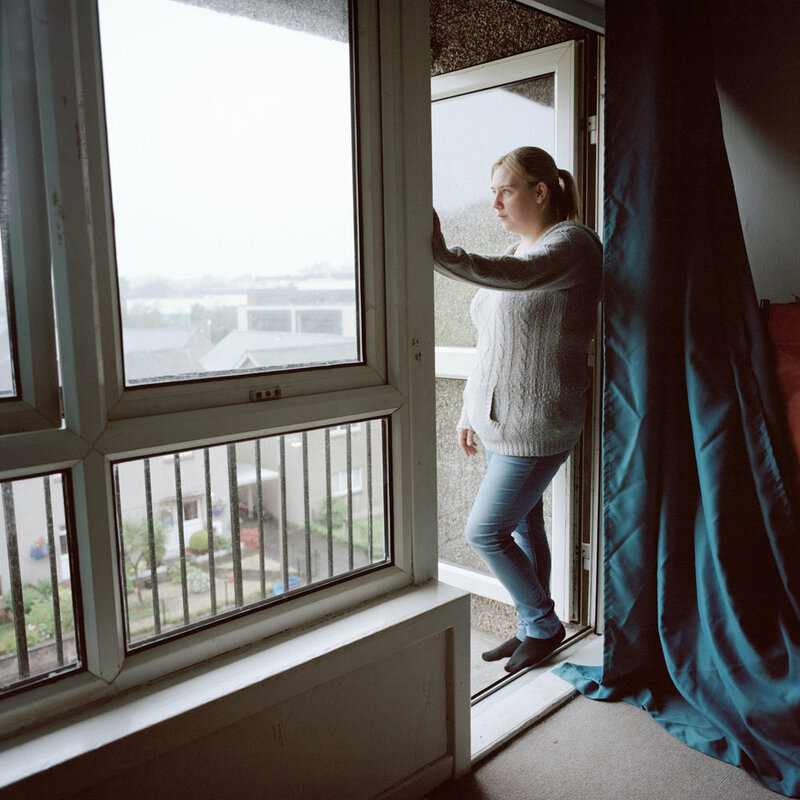 After several months in this temporary homeless accommodation flat, Steven got his own place. All his possessions were packed. Somehow it didn’t seem much for 34 years. A ‘place’ can be both mental and physical: where we put ourselves and where we are put, sometimes by others and sometimes by circumstance.